Mike Prazniak is a change practitioner and instructor working in the Revenue Cycle Program Management Office (PMO) at Florida Hospital. In 2015 Mike realized a personal and professional goal of becoming a Prosci-Certified Advanced Instructor (PCAI). In addition to leading major change initiatives and certifying over 100 practitioners, Mike has also worked to establish change management competency as one of the core attributes of the Revenue Cycle department. 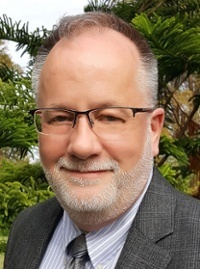 Mike is an active member of the Association of Change Management Professionals (ACMP) Global and serves as a founding member of the ACMP Florida chapter, where he currently serves as Chair of Membership, Communications and Events. First, tell me a little more about Florida Hospital. Florida Hospital is a 2,247-bed acute-care medical facility that is a member of Adventist Health System. We serve as a community hospital for Greater Orlando and as a major tertiary referral hospital for Central Florida and much of the Southeast, the Caribbean and Latin America. Adventist Health System operates 44 hospitals in ten states, making it the largest not-for-profit Protestant health care system in the United States. Why did the Revenue Cycle at Florida Hospital decide to invest in change management? 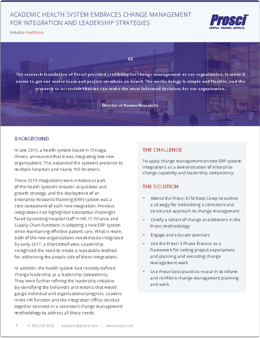 Was the department initially receptive to delivering Prosci change management training? I was extremely fortunate. We were going through a series of large system, process and departmental changes. My position was created to both manage change on large-scale projects and build a culture of change throughout our teams. I had a supportive executive sponsor who saw the value in the program and wanted all involved in leading change exposed to change management and those heavily involved trained fully as practitioners. How did you determine which program to deliver first? What were you looking to achieve? I decided to deliver the practitioner course first. The reasons were two-fold. I wanted project teams to understand the value of the tools and methodology and appreciate the amount of rigor, research, and psychology behind the approach. In addition to practicing change management, my leadership wanted me to develop a program capable of creating a culture of change at all levels. I felt the project team’s immersion in the concepts, tools and methods at the practitioner level would be a great place to start this cultural growth. The second reason was a bit more self-serving. I was on the Advanced Instructor track to become a Prosci Certified Advanced Instructor and wanted the practice. What benefits have you seen from being a Prosci Certified Advanced Instructor? It’s an advantage for the department to have someone who can certify people in change management. The fact that they get a certificate from Prosci with a seal means a great deal to them. The Senior Vice President and I both sign it. It is a nice touch. In the beginning, I spent more time during the program speaking about Prosci and the value of attending. Now people recognize that this is a valuable program. As far as the Organizational Change Competency license, it makes it easier to teach the class. From a logistics perspective, the license allows for us to print training materials on demand. It’s an easy interaction process with Prosci. How do you bring the program content to life? Relevant and meaningful stories, well-prepared activities, and passion for the topic. I have the good fortune of having worked in various roles throughout this organization for several years, from the front line to leadership, so I have many stories I can tell in a context my teammates understand and relate to. I also pull from other sources. I have been known to tell stories gathered from my Prosci classmates and instructors while I was in training, as well as those from colleagues I interact with. I also leverage music, props, and humor to create a fluid, dynamic environment which flows with rhythm, direction and purpose. What challenges do your participants encounter when applying the classroom learning into their day-to-day work? After class, those scenarios of “What if…?” manifest throughout project teams and timelines. I frame the change practitioner’s role as a strategist and supporter. I teach both: how change management should be done, and how it can be adapted to specific situations. My gratification comes when I see the practitioner customizing their approach to fit their need using the tools, methodologies and understanding they acquired in class. What actions have been taken to minimize gaps between knowledge and ability? We have spent much of the last two years developing the program and working through awareness, desire and knowledge. We are now focusing on putting in place resources accessible throughout the Florida Hospital Revenue Cycle and Finance practitioner community to focus on this critical aspect. It will be targeted as both ability and reinforcement using social media, lunch and learns, webinars, group discussions and face-to-face get-togethers. I’ve also recently established a virtual forum for certified practitioners that will allow for the dialogue and discussion necessary for them to continually educate themselves on change management in the organization. This online space will allow practitioners to come together and examine opportunities, explore ideas, and enjoy collaborative mind sharing in the discipline and practice. Which program has your organization been most receptive to? How has this impacted your training strategy? The three-day practitioner program, hands down. Our organization is focused on growth opportunity for upcoming leaders. This program offers strategies, methodologies and tools proven to successfully lead people through the change process while also providing the graduate with an internationally recognized certification. It fits perfectly into our talent development goals. What is one tip you would share with new change management trainers preparing to facilitate their first program? I know training inherently implies focusing on knowledge and ability. It’s tempting to focus all your energy on the deck, breakouts and activity preparation. Learning and practicing the delivery of the material will increase your confidence and develop ease in your presentation, but, remember, participants will have the tools and reference materials to help them recall the “how” of change management long after the class. It’s the “why” you must get them to understand, believe in and embrace. So, study and prepare, but know that real success will come from connecting with each individual in the room and sharing the passion for the why. Learn how you can facilitate all of Prosci's role-based change management training programs by attending Train-the-Trainer or attaining your own Prosci Advanced Instructor Certification. Want more examples of change management success in health care? Download this success story about a Midwest academic health system.